The Bubble™ is the preeminent, original staging concept – the perfect marriage of music, architecture and light. This breathtaking visual and musical act has taken the corporate entertainment market by storm. It is in great demand across South Africa, the UAE, Europe and as far afield as Australia and New York. With a glowing record of exceptional performances, thrilled audiences and delighted clients, here is a Specialty Act that never fails to deliver the quintessential wow factor. 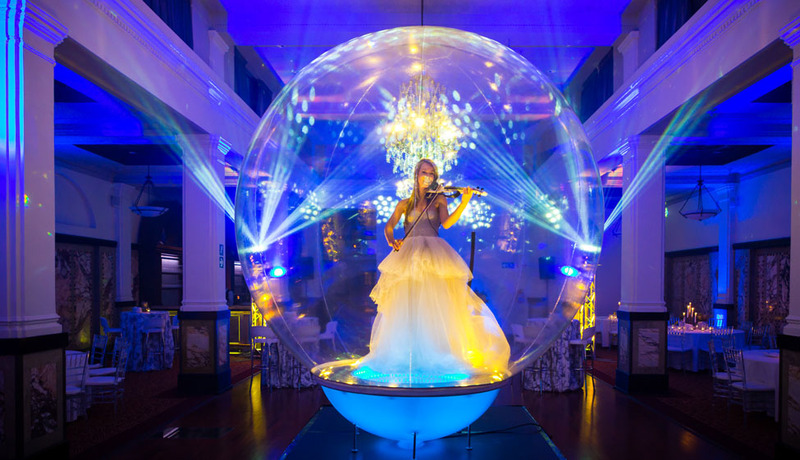 The Bubble elevates a musical performance by creating a magical space for artistry. It is a clear, glass-like, luminescent sphere that bathes the performer in light. Our handpicked musicians are the very best in their respective genres, and display exceptional skill, versatility and stage presence. The Bubble can be successfully utilized in a variety of settings during the night or day. The first, official and original concept of a musical performance in The Bubble™, Globe or Sphere is copyright-protected and owned exclusively by The Bubble™ Partners – Harpist Shelley Frost of The Fridge Dubai (who created the concept with her Harp in The Globe), Alastair Thorns (designer and architect) and cellist Carol Thorns of Red Cello Productions. The Bubble™ is now available for events in South Africa, The UAE, The UK and Europe. Easy to set up and strike, The Bubble is suitable for occasions from small corporate functions to large conventions and exhibitions.